I just added a more to my tapestry I have on my Big Sister. Trying some more new things. I still need a lot of practice, but this is why I’m using what little bit of acrylic I have in my stash to practice with before I move onto my handspun and more expensive yarns. Subtle blue and purple tiger/vertical stripes, then a staggered shape with a triangle on the left. One partial row of rya, and then basic fill. You can see the blue and purple stripes better here. Next ones will contrast more! I’m still having lots of fun doing this. I think I’ll try and tackle a bigger triangle next. or maybe a circle. Too many shapes! I am finally going to give tapestry a real try. I think I mentioned in my last post that I tried it before on my rigid heddle loom (a Schacht Cricket) that it just didn’t work on that loom. Last week I picked up a little Hokett loom from Webs. I did up a simple striped tapestry to try it out. I used my handspun yarn, so it’s thick and thin, so the warp shows through in places. I really don’t mind with this one though as it was mostly for experiment purposes. I have not decided on how I’m going to hang it, so I tucked the top loops behind the weaving for this picture. I wanted to add something interesting and that is what the tails are at the top. I may try this again with a better weaving and add beads. We’ll see. On Friday my Mirrix Big Sister arrived. I got it warped up Saturday morning but I did not start weaving until last night as I wanted to finish the little one above first. This is the progress I made last night. Using some videos on youtube, I am slowly getting the hang of it. Bubbling is new to me so the selvedges are a bit off, but I’ll get better as I go. Starting off with simple stripes and did some blocks. The hardest part for me so far is deciding which technique I’m going to try next! 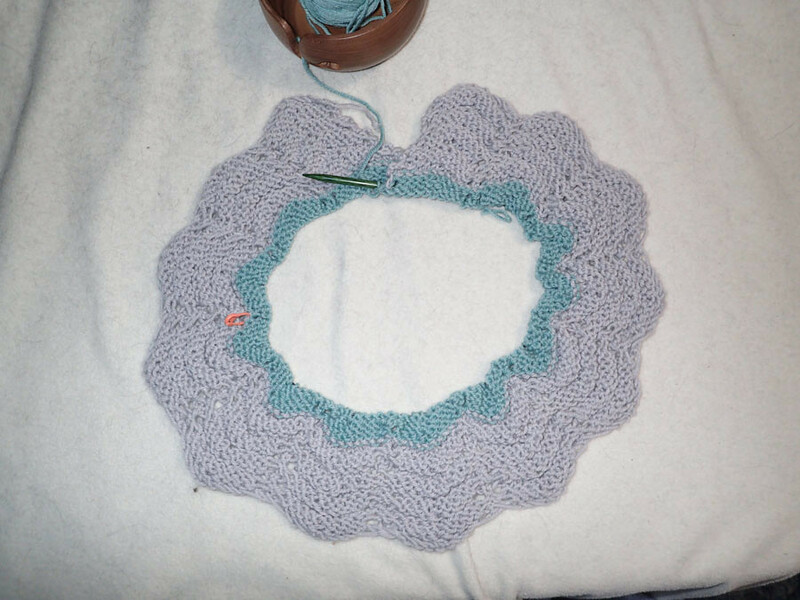 I have made more progress on the baby blanket for my sister. Last night I started the next color stripe; teal! I am still really enjoying this pattern. Simple but looks really pretty. It’s a bit harder to see the ripples in the above picture, but they are there. So far I have only made one mistake and hopefully I will not make anymore. If you would like to follow my project on Ravelry, click the picture and it will take you to the page. My younger sister is due at the end of the month, or beginning of next. A girl named Shailyn. My sister asked me to make a baby blanket for her in the colors grey, purple, and teal. I picked out a pretty pattern with cables and bought the yarn for it. When I got home, I looked over the pattern more thoroughly and my brain exploded due to how it was written out. I put that pattern aside for now and instead found an easier one that won’t stress me out but is still pretty. The one I chose is from Project Linus and can be found on Ravelry here. I had a bit of a rough start with this and ended up ripping out the few rows that I had finished because I could not figure out where I messed up. 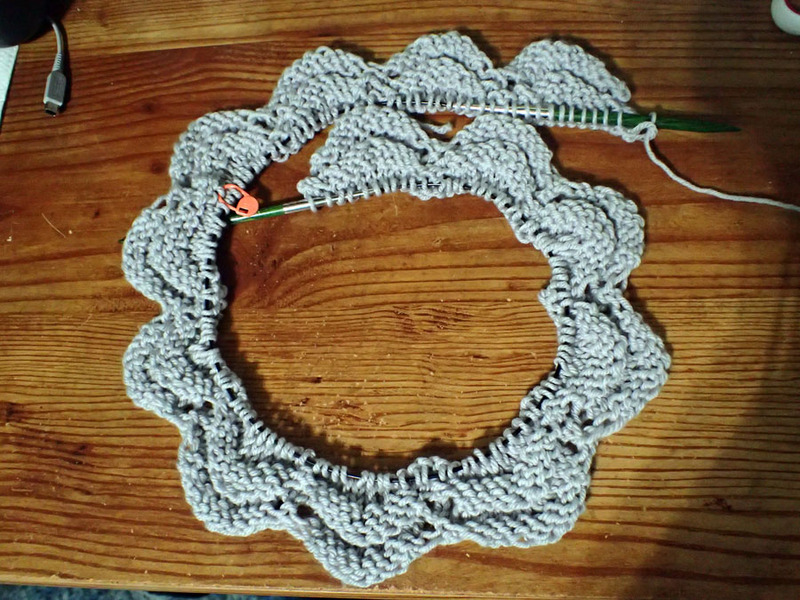 Now I have finished four repeats of the pattern, making twelve rows since there are only three in the pattern. Here is my progress as of right now. I am not sure which color I am going to do next. I may just reach blind into the bag and go with whichever I pull out, aside from more grey. I am liking how this is coming out so far, so I hope that my sister will like it too. Want to track my progress? Then follow me over on Ravelry!